Celebrate with your loved ones as you send online these Comforting Kids Chocolates and increase happiness in their lives. This alluring Set of Chocolates are really delightful and are appreciated by the kids. 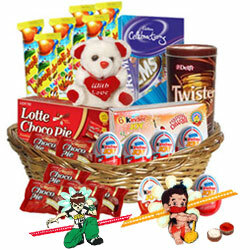 This Set consists of a Mini Celebration Pack, a Pet Jar of Twister, 6 Pcs Kinder Joy, 6 Pcs Chocopie, 6 Pcs Alpenliebe Lollipops and a 6" cute Teddy arranged in a Basket with 2 Kids Rakhi and Roli Tilak Chawal.